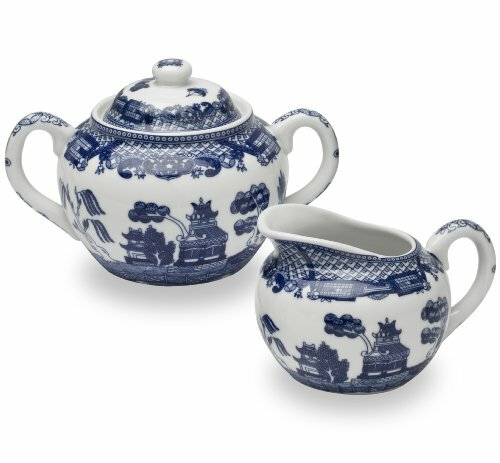 HIC’s Blue Willow Creamer Dispenser and Sugar Bowl with Lid Set depicts the popular and highly collected Blue Willow dinnerware design. Originating in England, circa 1780, this richly illustrated design, featuring a weeping willow, pagoda, bridge and lovebirds, portrays the Chinese legend of a wealthy man’s daughter who’s fallen in love with her father’s clerk. The father pursues the newly eloped couple through his garden and onto the bridge where they transform into lovebirds and fly off beyond his reach. Whether serving coffee, afternoon tea, or entertaining for the holidays, Blue Willow is casual enough for use every day, yet elegant enough for those special occasions. This beautiful matching Sugar Creamer Set is perfect for every coffee and tea service and for enjoying hot chocolate, spiced cider, even warm milk and honey, and other favorite beverages. Crafted from fine-quality porcelain, the easy-hold handles offer a comfortable grip and secure transfer to and from the table. A drip-free spout makes pouring mess free. Perfect for serving sugar with cream or milk, and works great for salad dressings, too. It performs equally well for hot or warmed contents, like hot maple syrup, drawn butter, au jus, sauces, and gravies. Microwave safe for quick reheats, the easy-hold handle offers a comfortable grip during use and keeps fingers away from hot contents. They make great gifts for art enthusiasts and tea lovers, or hostess gifts and coffee gifts for at-home baristas. A tradition since 1957, HIC Fine Porcelain is safe for use in the microwave, oven (to 500-degrees Fahrenheit), and freezer. Dishwasher safe for easy cleanup. This 3-piece set includes (1 each) Blue Willow Creamer Dispenser with Sugar Bowl and matching lid. Publisher: Harold Import Company, Inc. Studio: Harold Import Company, Inc.